Do sugar substitutes really help you eat healthier and maintain balanced blood sugar levels? Cheeseburger. Large fry. And a…Diet Coke®. The drive-thru window isn’t the healthiest place to be gathering sustenance, but somehow when we order a diet soda instead of a regular soda, we feel as if we have accomplished something. Diet drinks don’t use real sugar, so they balance out the poor food choices at a meal like the one above, right? Although artificial sweeteners make the foods and drinks they’re in a little healthier than ones with added sugar, they really aren’t helping our diet if we’re still consuming fatty foods. But if you have made the commitment to eat a little better, then choosing an artificial sweetener can be helpful for shedding pounds or keeping blood sugar balanced. So, how do you know which sweetener is best? Is one sweetener healthier than the others? “Artificial sweeteners, or sugar substitutes, are considered to be any type of sweetener that replaces regular table sugar,” she said. The FDA recognizes these sweeteners as non-nutritive sweeteners. What are the different kinds of sweeteners? There are seven different kinds of artificial sweeteners approved by the FDA. Acesulfame K – a combination of organic acid and potassium. It combines well with other non-nutritive sweeteners and is stable at baking temperatures. Aspartame (Equal, NutraSweet) – is approved as a general use sweetener. It contains a high intensity of sweetness, so very little is needed to attain the amount of sweetness desired. Luo han guo extract – Swingle Fruit extract; also known as monk fruit. Neotame – approved as a general sweetener, but rarely used in foods. Saccharin (Sweet’N Low) – the oldest approved non-nutritive sweetener. It is approved as a food additive for gums, cosmetics and pharmaceuticals. Sucralose (Splenda) – a derivative of the sucrose molecule. Stevia – extracted from the Stevia plant. It is stable in dry and liquid form. Why were sweeteners initially added to our food? The discovery of these sweeteners has also allowed those with blood sugar health problems to sweeten their food and drinks without the added calories or sugar spike. Even though there are recommendations for the amount to consume, Ms. Russom said that the average adult doesn’t exceed the ADI for any of the artificial sweeteners listed. 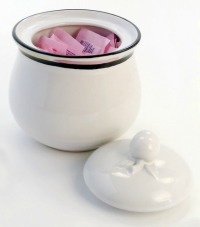 For more information about artificial sweeteners, visit the Academy of Nutrition and Dietetics’ site at www.eatright.org.